Fortune Teller Slots knows your faith in detail. This magnetic lady has 5 reel 30 paylines to tell your the truth about shiny future guaranteed by NetEnt. Cards never lie, so listen to their gentle whisper of your lucky nature. 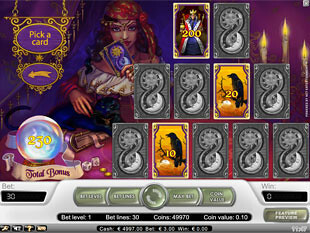 Win the top jackpot of 7,500 coins flavoured with Free Spins, intriguing bonus game and promising multipliers. Catch your magic ball to meet your destiny at no download format. Evil Black Cat, lucky Horse to take you to another paradise, Cart, pretty Gypsy, Magic Ball and Wild Horoscope transfer you into mystic atmosphere of supernatural powers where the whole picture of your life is revealed. Such tarot cards as Ace, King, Queen, Jack and Ten can be of use to make your roads to happiness more obvious. To pay a gypsy for your lucky fortune you should choosing among such coin sizes as $0.01, $0.02, $0.05, $0.10, $0.20 and $0.50. There are 4 levels to play with. It means you can bet 1, 2, 3 or 4 coins per line. The highest jackpot is 7,500 coins or $15,000 for 5 Wild Horoscope. The second jackpot is 2,000 coins or $4,000 for 4 Wild Horoscope. The third highest jackpot is 500 coins or $1,000 for 5 Black Cats or for 5 Horses. Wild Horoscope is the wild symbol. This magic symbol can substitute for any other icons to predict your destiny… or just say your horoscope for today. 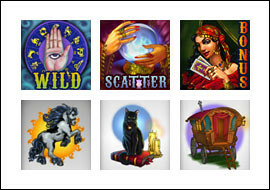 If nothing goes as planned try to break the karma and get the top jackpot catching 5 Wild Horoscope icons on the payline. Magic Ball is the scatter symbol. The scatter win is multiplied by your total bet. The rule is simple. The higher is your total bet, the better prizes you can get. With 2, 3, 4 or 5 Magic Balls scattered on the reels you will multiply your total bet by 2x, 4x, 50x or 200x. 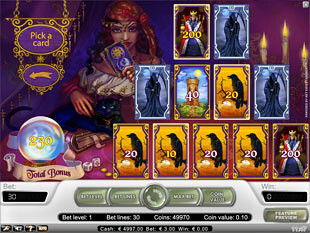 Collect Magic Balls to win up to $12,000 maximum. Free Spins. Nothing is free… except your life. Catch at least three Magic Balls to activate 12 Free Spins. Invite mystery into your world of routine and triple your prizes during this magnificent feature. Be powerful enough to get 5 Wild Horoscope symbols and win the highest possible award of this game – 22,500 coins or $45,000. Bonus Game. 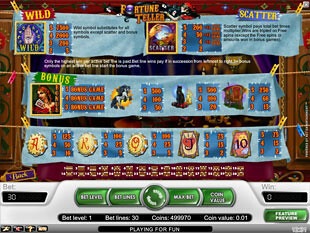 With three or more Gypsies on the payline you will activate Bonus Game. Find out your next path to follow with several Tarot cards to choose from. You have three chances to pick your destiny-make card and reveal the prizes hidden. Sand castles, sweet love or maybe sad death to meet you halfway. It is your choice. Your destiny. So make it wisely. 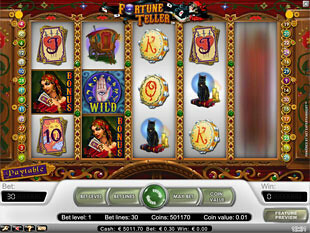 Fortune Teller slot machine is a powerful tool to predict your destiny and reveal your prizes. Catch the glimpse of luck with a wise gypsy showing you the way to success and harmony. Don’t be tricked with wind of changes and keep playing to win more.